Click Here For our Holiday Special! 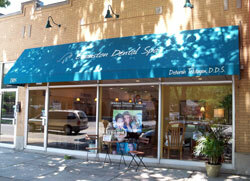 At Evanston Dental Spa, Dr. Deborah Tekdogan and staff will make your smile and comfort their top priority. Dr. Debbie and her team are dedicated to providing you with the personalized, gentle dental care that you deserve. Let Dr. Debbie Care for You! At Evanston Dental Spa, Dr. Tekdogan and her team take pride in providing comprehensive dental care to the discriminating adult patient. Whether you are looking to restore your smile with dental implants, rejuvenate your look with cosmetic dentistry, or to refresh your smile with a thorough cleaning & exam, Dr. Debbie and her staff will cater to your every need. SKIN CARE: Featuring Botox, Juvaderm, Chemical Peels, Clarisonic, Neocutis and Avene/Glytone products. Part of our commitment to serving our patients includes providing education allowing them to make informed decisions about your oral health. We hope that we may provide you with the tools you need to make the best decision for your bright smiles. Call (847) 328-8500 or Request An Appointment Online! We genuinely hope that we will see you soon in our office. Please contact us 847-328-8500 if you have any questions or would like to schedule an appointment. Located 30 minutes North of Chicago at 2805 Central Street, Evanston Dental Spa proudly serves patients from Skokie, Wilmette, Morton Grove, Glenview and is within easy reach from the North Shore Suburbs and downtown Chicago. Evanston Dentist, Dr. Deborah Tekdogan is dedicated to cosmetic dentistry such as Exams, Teeth Whitening, Veneers and more. We are looking forward to your visit to our Evanston, Illinois dental office.